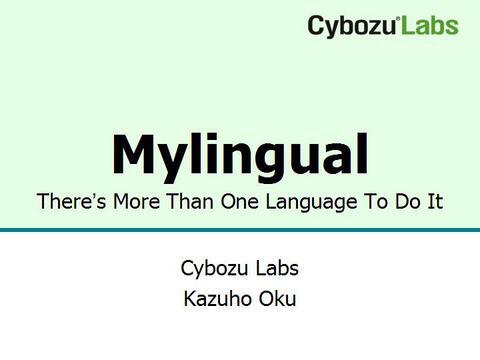 Last week at YAPC::Asia 2007 Tokyo, I had the opportunity to give a presentation on Japanize and Mylingual. Although my notebook computer hung up twice :-( during the presentation, it was a great time for me, not to mention the entire event. Kudos to the staff! Below are the slides I used. BTW, I fixed the feed URLs linked from the per-language translation list pages, so that the tranlators can be notified of their updates. Sorry for your inconvenience. Below are the screenshots of Mixi and livedoor Reader, with their user interface translated to English using Mylingual. FYI, Mixi is a leading SNS provider in Japan, and livedoor Reader is a very nifty RSS aggregator built upon AJAX. Although not perfectly translated for technical and non-technical reasons (not enough translation data have been submitted yet, Mylingual cannot translate images), you can see that the webapps become much more useful when localized to your mother language. To start using Mylingual, visit mylingual.net.